The scene of the incident on Thursday night. 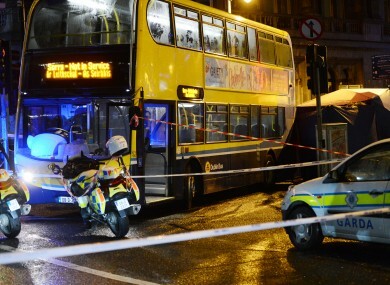 GARDAÍ HAVE NOW identified the man who died after being struck by a bus at the junction of Nassau Street and Dawson Street in Dublin on Thursday night. Earlier today Gardaí issued this appeal for information to help identify the man with a detailed description. On Thursday night he fell or was pushed onto the road and was struck by a bus. He was pronounced dead at the scene and Gardaí said they were treating the death as suspicious. A man in his late 20s who was arrested in relation to the incident remains in Garda custody this evening in Pearse Street Garda Station. This evening Gardaí said they were still appealing for witnesses to the incident to contact Pearse Street Garda station on 01 – 666 9000, the Garda Confidential Line on 1800 666 111, or any Garda station. Email “Gardaí identify man who died in Nassau St incident”. Feedback on “Gardaí identify man who died in Nassau St incident”.